A massive transportation complex dominates Jersey City’s Journal Square, a grotesquely ugly concrete-block monstrosity of the type favored by urban planners in the 1960s and ‘70s. Thousands of commuters pass through the transportation center each day as they head to New York or Newark on the PATH subway trains that rumble underground. Few of those commuters spend any time in Journal Square itself, though. Grove Street, one stop up the PATH line, offers trendy cafes, fitness centers, and shops. In contrast, Journal Square is populated by a grim lineup of Subway sandwiches, Dunkin’ Donuts, a dollar store, and discount clothing retailers. Even the Jersey Journal—the newspaper for which the square is named—has left, moving its offices to Secaucus in 2014. The hopeful banners adorning lightposts that welcome visitors to “The NEW Journal Square” aren’t fooling anyone: Journal Square hasn’t been new in a long, long time. You have to look back to before the Second World War to find the glory days of Journal Square, when the area—already a transportation crossroads—was also the place to go for shopping, dining, or a movie. Especially a movie: the square once boasted three lavish movie theaters, the kind of elaborate facility known as “movie palaces.” One of the three, The State, is gone. 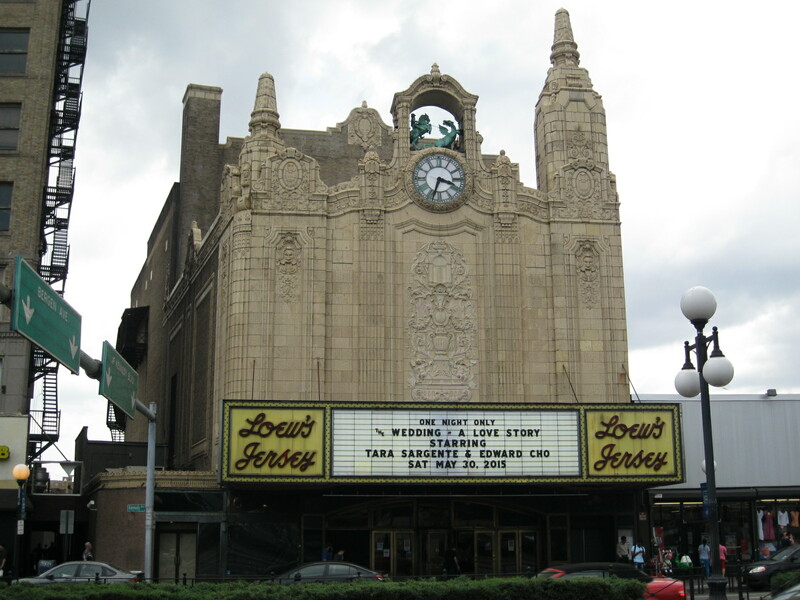 But the other two—The Stanley and Loew’s Jersey—remain, physical testimony to an era when Journal Square was a destination, not a transit point. I’ve been passing these old theaters for months, riding the bus to and from the PATH station, and finally decided last weekend that I wanted to take a closer look. On Sunday afternoon, I laced up my sneakers, slipped my camera into my bag, and ran (well, mostly walked really, really fast) the two miles down John F. Kennedy Boulevard from my apartment to Journal Square. By the time I arrived there, the thunderstorm that was forecast for late afternoon was sweeping in several hours ahead of schedule, the clear blue skies rapidly giving way to ominous dark gray clouds. I approached The Stanley from across the street first, getting a full view of its eye-catching copper marquee, somewhat dull from the shadow of clouds massing overhead but beautiful nonetheless. Movies and stage shows played at The Stanley for half a century, from its opening in 1928 through the day the doors closed in 1978. Five years later, the neglected theater was purchased and turned into an assembly hall for Jehovah’s Witnesses—still its role today. 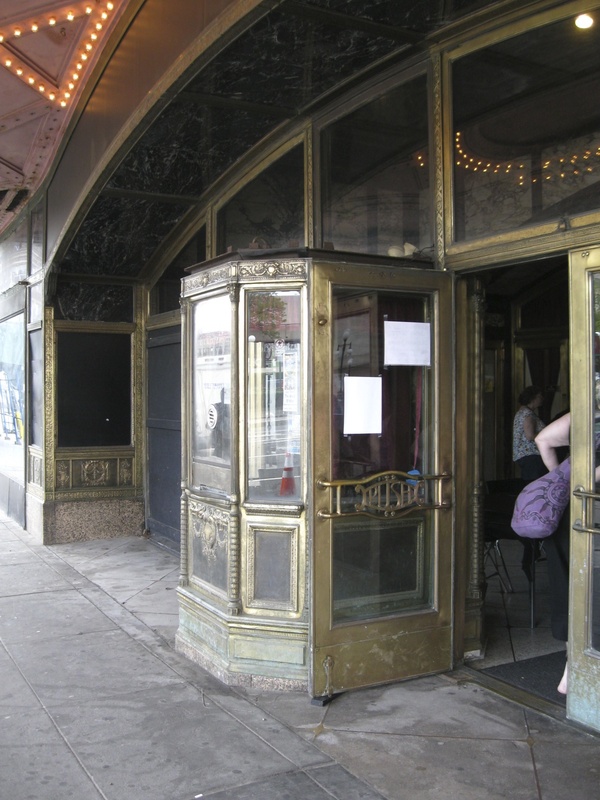 On two occasions (1983-85 and 2012-13), the Jehovah’s Witnesses have organized massive volunteer operations to restore The Stanley, ensuring that the theater retains its original Venetian-inspired opulence, even as its function has changed. Continuing down JFK Boulevard as rain drops began spattering the sidewalk, I took refuge under the grand marquee of the Loew’s Jersey. Completed in 1929 (opening day was only one month before the stock market crashed in October of that year), the exterior of the Loew’s is far more ornate than that of The Stanley. Carvings adorn the sand-colored stone façade, an oxidized green statue sitting at the top beneath a stone arch. 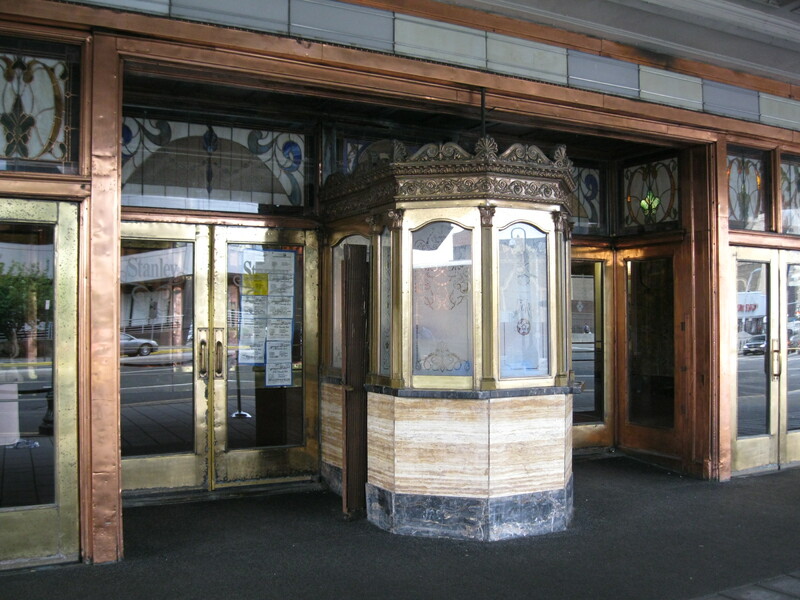 The old-fashioned ticket booth, now faded to a dull brass, is decorated with scrollwork. A sign posted outside boasts that the Loew’s houses the “Best Movie Theater Organ in NYC Area,” per The Village Voice. Everything about the Loew’s hints at its glamorous red-carpet past. But the theater is not fully operational these days. 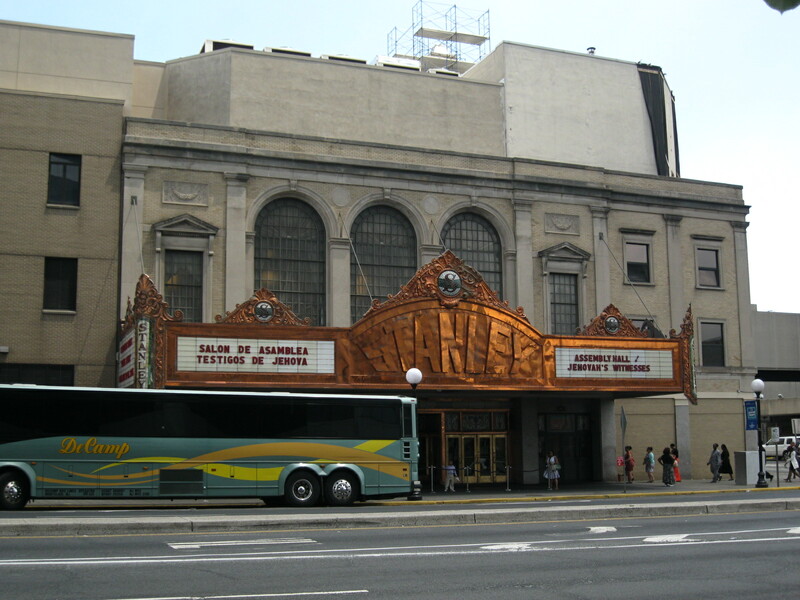 Like The Stanley, the Loew’s saw business dry up in the 1970s as people moved from Jersey City into surrounding areas and began patronizing suburban multiplexes. 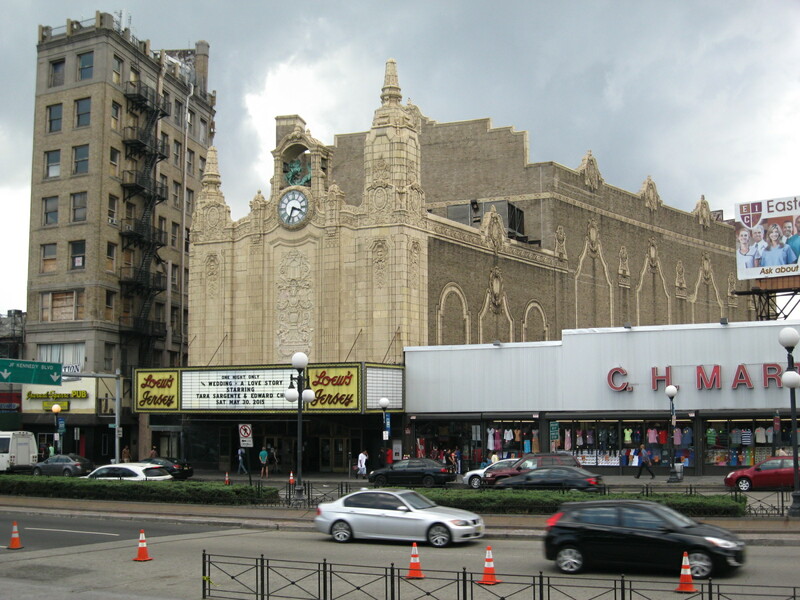 Closed in 1986, the theater was slated for demolition; only a six-year crusade by a newly formed “Friends of the Loew’s” saved the building, which had fallen into terrible disrepair. But for the past two decades, the Friends have struggled to realize their vision of restoring the Loew’s to its former splendor, a project that has gotten bogged down in battles with the city, which now wishes to bring in a national developer and turn the theater into a concert space. The Friends have fought back, and only last week won a victory in court as a judge upheld their lease on the theater. For the time being, at least, the Loew’s will continue as it is, holding special screenings of classic films. One such screening actually prevented me from checking out the interior of the theater on Sunday: I found that ushers at the door were selling tickets for a showing of a Star Trek movie that would begin shortly. Not much of a Star Trek fan, I turned around and walked across the street to get a closer look at The Stanley. I really enjoyed that! It does appear as if they may have added new street lights, emphasis on the word “may”. Have a great weekend—who knows? Maybe the sun will shine (my poor drowned hibiscuses! ).